What options are available to treat PTSD? In our previous blog series we discussed trauma as it pertains to post-traumatic stress disorder and then outlined the set of symptoms that folks experience after trauma that might indicate they have PTSD. Now let’s talk about treatment. Post Traumatic Stress Disorder is a treatable mental health condition. There are a variety of treatment options available as it is not a one size fits all approach. There are evidence based therapies (empirically researched effective treatment approaches) that are show to be very effective in treating symptoms of PTSD. Two of which are used in our clinic include Prolonged Exposure Therapy and Cognitive Processing Therapy. Both are meant to target symptoms of PTSD as a means of symptom reduction. These are not ways of coping with PTSD, but rather ways of decreasing symptoms all together. 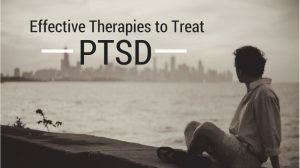 This is a major distinction as some treatments are focused on helping you cope with your post-traumatic stress disorder symptoms while other treatments are focused on reducing the symptoms all together. Here at Freedom Within we believe in helping you reduce your symptoms while also teaching coping tools. Along with these treatment approaches EMDR is shown to be an effective method of treatment. Medications can be helpful in reducing PTSD symptoms, however, they tend to have a band-aid effect versus a long term answer to the problem. If you are considering psychotropic medications speak to a qualified psychiatrist about the risks and benefits of medication for your situation. If you are still in the military you may have questions regarding confidentiality. Know that when seeking therapy at a civilian office your command is not informed of your treatment without proper consent from you or court order. We pride ourselves in maintaining confidentiality throughout the therapy process and understand how important this is for our military personnel. Know that as a service member or Veteran you do have rights to seek outside counseling without others knowing your diagnoses or treatment. With either treatment you can expect that you will have to discuss the traumatic event in some capacity. Your therapist will be there to work alongside you helping support you through the process while gently pushing you to continue to expand your limits. We will never make you do something you do not want to do, you always have control and the last say, however we will always encourage you to push a little outside of your comfort zone as we know how important that is for emotional growth. The benefit of working with Freedom Within is that we have done this work with hundreds of patients and we know best how to balance the support and the encouragement for growth. We have also used these therapies hundreds of times and know how to effectively implement these techniques. What are the symptoms of PTSD? How do I know if I have it?What will happen if I never get treatment for PTSD?